Beatrix LeBeau, Slime Rancher protagonist, has had fun wrangling slimes for a while now, and if this latest update is any indication, she’ll have plenty to see and do… until the cows come home. Get it? Because… even though it’s somewhere in the far reaches of space, Slime Rancher is still about farm– right. Anyway: science! SCIENCE! Wicked creations, powered by Slime Science. Muahahahaha! Little over a month ago, crystal slimes were added to the ever growing list of creatures for ol’ Beatrix to wrangle for profit at the ranch. A neat addition for sure, and one which also brought new areas to explore, a couple new features, bugfixes and so on. Fun, although it pales compared to what the Slime Science patch from yesterday added. I mean, really… science. In a world where slimes are all over the place – and not all friendly either, I might add. Yeah. No comparison. Now, in case you’re wondering: no, this is not premium DLC. 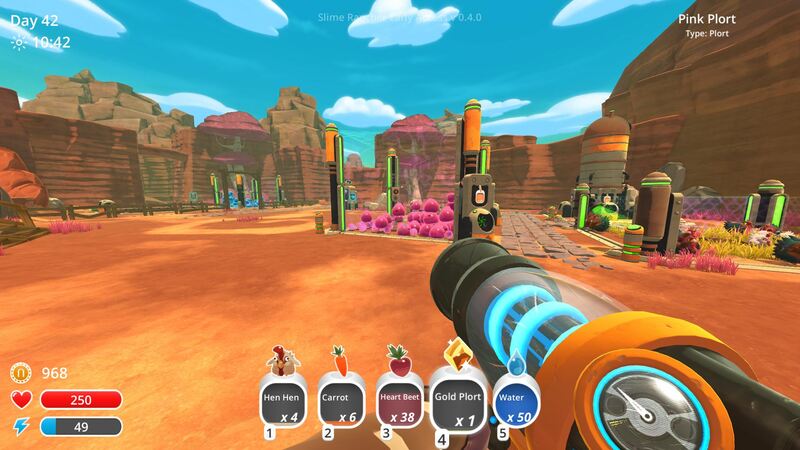 Slime Rancher is still in Early Access, and very few games – in an unfinished state – have taken that route. This is not one of them. As such, accessing the new content is as simple as racking up enough moolah and purchasing the Lab ranch expansion. After that, you’re good to go. For science. There’s quite a bit to acquire / build here, including something that enables teleporting across, well, who knows how great a distance? Only one way to find out! Or how about an extractor, used to acquire resources from the environment? Yup. Time to get into the oil – or whatever is out there – business. On top of that, there are also things which fit more into the decorative / ‘just because’ category, including toys and decorations (see? decorative). And they’re not even remotely done adding sciencey stuff. Ah, more of an explorer type, are ya? In that case, you should head off to the Dry Reef and the Moss Blanket, as both have new areas to visit, even if the latter is more of a ‘taste of things to come’. Come to think of it, something tells me the majority of this patch is just that – a teaser of what the future will hold for Beatrix’s slime wrangling adventures. Color me intrigued. Slime Rancher [Early Access] is available from Steam, at $19.99.